Yes... I subscribe to many magazines, but it's all in search for the best shoujo and josei to read and share. I also have a nice library of materials for the group. I admit that I love curating all the works for this group. Anyhow... this month I hope to show the depth and breadth of works this group does. There's a lot more to shoujo than girl focused high school dramas. 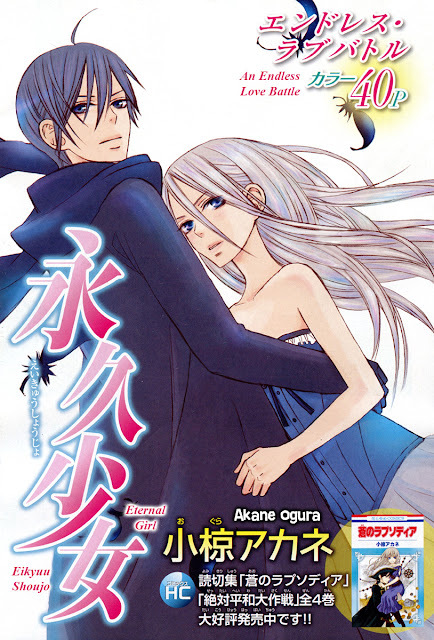 To start things off, I've selected the latest oneshot from one of the first mangaka we started translating, Akane Ogura. We took on "Zettai Heiwa Daisakusen" halfway through the series. Since then, we've continued to translate her oneshots and we hope to eventually release our version of all of her oneshots. Her next work will appear in Lala DX 7, which comes out on June 10th, followed soon by another compilation of oneshots, which we will translate. We hope to squeeze in the new oneshot during this celebration, so please look forward to it. Next, on June 3rd at 12:01am, will begin a trio of Vampire Wedding oneshot from one of our new favorite mangaka, Mika Kajiyama. Get ready for a week of loveliness!